We offer a structured graduate programme that combines cutting-edge research with a curriculum of lectures, colloquia, and workshops, focused on the interdisciplinary research field Solvation Science. 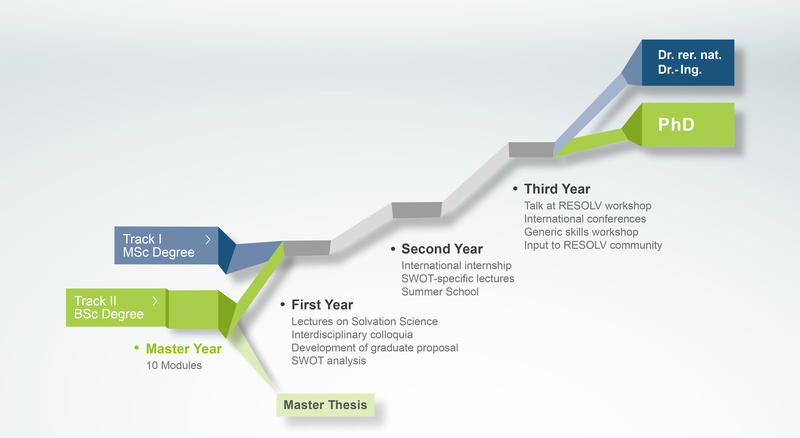 Track I is designed for graduate students who enter the iGSS at master level. Within the framework of RESOLV, an interdisciplinary lecture series held by international experts in the field of Solvation Science is continuously offered. All iGSS members are provided with own funds to attend international conferences. Track II is designed for graduate students who enter the iGSS at bachelor level. They will have to pass through a preparatory year, in which they have to complete modules of the iMOS master’s program, before they proceed with their doctoral research project and the above mentioned three-years curriculum.